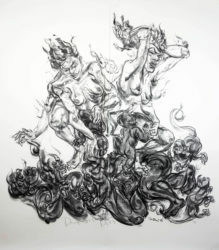 One of Singapore’s preeminent contemporary artists, Jimmy Ong has been noted for his large-scale, figurative charcoal works on paper since his first solo exhibitions in the 1980s. His early, pioneering work focused on sexual identity and gender roles, often within the context of the traditional Chinese family. Ong has, over the past twenty-five years, explored the ways in which multiple identities and perspectives – whether sexual, ethnic, national, or even generational – can coexist within the individual. His deeply personal works have taken inspiration from a stark analysis of his own experience, and indeed of his own physical form, an ongoing process of what he calls “creative self therapy.” In recent years, he has investigated issues relating to marital roles, informed in part by his experience as a spouse in a gay marriage. 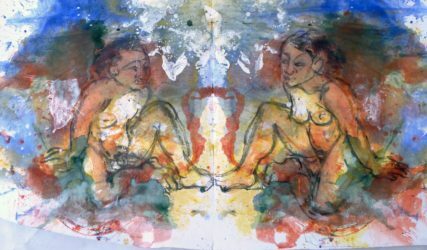 His inquiry has gradually broadened from the personal to the plural and has incorporated gender archetypes as conveyed through mythology and spiritual traditions. His seminal exhibition, Sitayana, exhibited at Tyler Rollins Fine Art in 2010 and subsequently acquired by the National Art Gallery of Singapore, marked the first major public exhibition of this new focus, with its feminist re-imagining of the ancient Indian epic, the Ramayana, a work which continues to play a vibrant role throughout Southeast Asia, acting as an endless source of inspiration for the region’s folk and popular cultures. 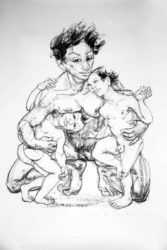 Ong used the Ramayana as a point of departure in creating new narratives that were informed by his sensitivity to the way gender roles play out in contemporary relationships. Recent exhibitions include: an important collection of 100 newly acquired works from the 1980s at the National University of Singapore Museum (2013-14); an exhibition at the Private Museum, Singapore (2011); and an acclaimed solo show of new works, entitled SGD, at the Singapore Tyler Print Institute following his residency there (2010). In 2012, Ong’s investigation of the contemporary resonance of ancient myths led him to a series of projects in Yogyakarta, one of the major artistic centers in Java, Indonesia, where he began documentary research into gender roles as reflected in folklore as well as contemporary society, the latter specifically relating to the local transgender community. Sections from these projects were presented as part of the parallel programs of the Biennale Jogja XII in Yogyakarta (2013). His most recent exhibition at Tyler Rollins Fine Art, Elo Progo (2013), took its name and inspiration from the confluence of the Elo and Progo rivers – one said to be male, the other female – located in the Kedu Plain near Borobudur, the world’s largest Buddhist temple and one of Java’s most sacred ancient sites. Ong was captivated by this local myth as well as the traditional Javanese practice of meditation in water. The Elo Progo exhibition centered on Ong’s first public showing of video works, which were inspired by the rituals of water meditation and informed by themes of gender fluidity and mythic transformation. The exhibition also included a new body of works on paper, done in richly colored gouache, that appropriated a type of Chinese splash ink brushwork in mirrored patterns created by the repetitive folding of the paper along an axis. Through a circular and meditative process of drawing, transferring, and redrawing, which echoed the cyclical, ritualistic time of the videos, Ong created a vivid series of works that featured a recurring, androgynous figure. In various degrees of abstraction, the figure was shown twice in each work, in a mirroring of form reflecting Ong’s ongoing interest in ideas relating to duality, gender binarism, and the fluidity and transformation of identity.